Organizing a kitchen? 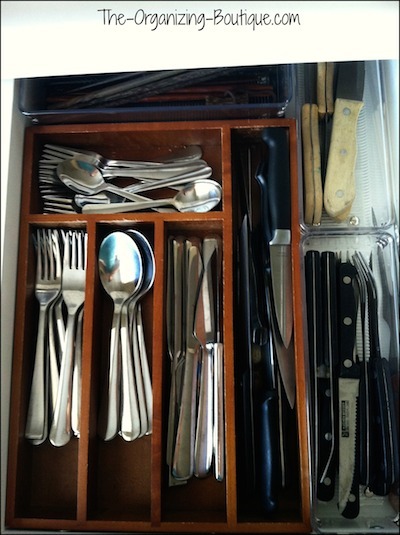 Kitchen drawer organizers are necessary for keeping utensils and other cooking items separate and orderly. It is so nice to be able to find what you need when you need it, especially when it comes to cooking and eating. The following tips on organizing kitchen drawers will guide you through the organizational process as well as suggest some useful kitchen storage organizers. Enjoy! Follow the process on the organizing kitchen page to purge the drawers of any unnecessary items, sort what's left and figure out what to store in which drawer. 1. A quick tip for deciding what goes in which drawer is to first consider how many drawers you have in your kitchen. If you only have one drawer, then this will most likely be best for eating utensils. If you have several drawers, try to put things in drawers nearest where they get used. For example, the drawer by the stove could contain oven mitts and/or cooking utensils. 2. Separate out the cooking utensils you use really frequently. These could be stored in a jar near the stove for easy access and to save drawer space. 3. Like goes with like. Put eating utensils in one drawer, cooking utensils in another drawer, food storage items like aluminum foil in another and so on. 4. DO NOT FORGET ABOUT THE JUNK DRAWER. You need one...ONE. The kitchen becomes a dumping ground, because it is such a high traffic area. If you have a place to gather all of the random items, then you will avoid cluttered counters. Clutter is the build up of items you don't know what to do with, so contain them all in one drawer. 5. Once you know which items are going in what drawer, then you can incorporate kitchen drawer organizers. 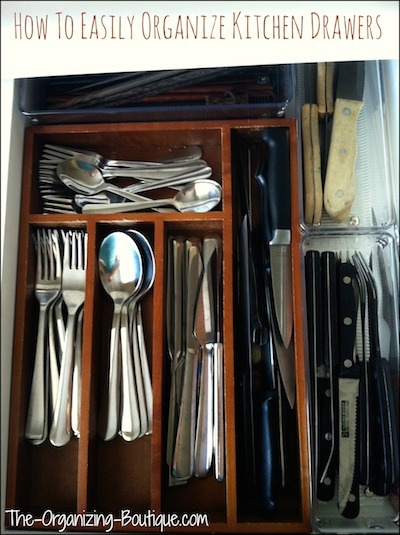 Below I use a kitchen drawer organizer for the utensils and acrylic modular organizers for extra things like steak knives and chopsticks. 6. 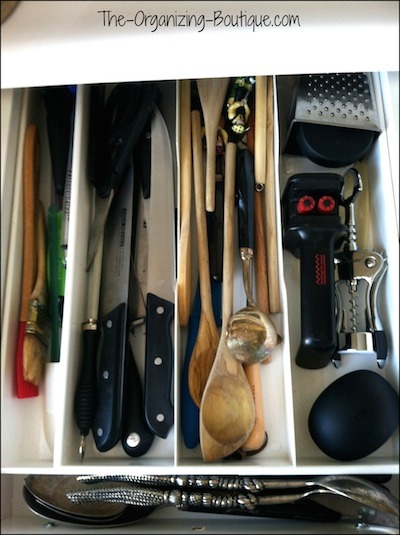 Expandable drawer organizers are good for the cooking utensils since they are all shapes and sizes. See the photo below. That kitchen drawer organizer has moved with me several times and has conveniently worked in different-sized kitchen drawers. 7. If you're low on kitchen drawer space, then consider using kitchen cabinets and/or another place in the house (i.e. for seasonal items like outdoor grill tools). Kitchen drawer storage organizers are so much fun. Take a look at these! These are drawer organizers offer modular kitchen designs, so you can customize them to fit your needs. I use them in the kitchen, but they can also be used in the bathroom, the office, you name it! This is the drawer organizer I use in my kitchen for cooking utensils. It expands, and I love it! This organizational product is fantastic for getting the junk drawer in order. Sturdy, roomy and colorful, these jars are great for holding frequently-used cooking utensils on the kitchen counter. This kitchen organizer expands, is made out of bamboo and has different-sized compartments to hold a variety of utensils. Organizing kitchen cabinets? Turn them into kitchen drawers with this awesome, customizable product. Check it out!